Vic Ungasis is an archaeologist who has recovered the Kali of Humabon and is looking for a partner sword, the Kampilan of Lapu-Lapu, plus the Peseta, one of Judas Iscariot's 30 pieces of silver which reportedly gives the bearer immortality. Upon returning home, he reunites with the Escalera brothers, who have become successful real-estate developers. However, a Yakuza who has acquired the Kampilan wants the Peseta so it could be merged with the sword for unmatched power. Iskul Bukol 20 Years After (Ungasis and Escaleras Adventure) is a Philippine comedy movie starring actors Tito Sotto, Vic Sotto, and Joey de Leon. 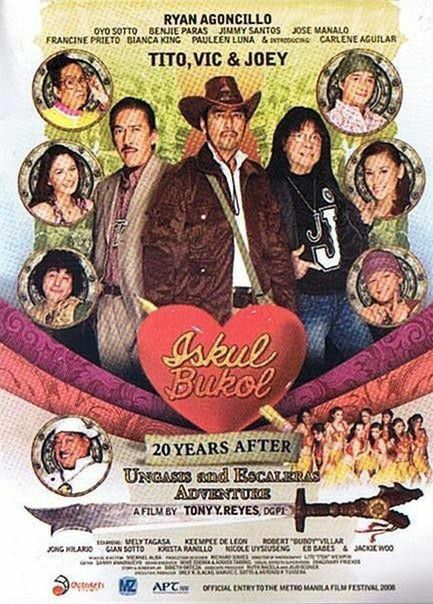 It is part of the Iskul Bukol franchise, depicting its characters 20 years after the end of the original TV series. It is also the fourth Iskul Bukol film (after 1977's Iskul Bukol the Movie, 1980's Iskul Bukol Freshmen, and 1987's The Best of Iskul Bukol: The Movie).